Machine learning (ML) is playing an increasingly important role in cyber security. Here at FireEye, we employ ML for a variety of tasks such as: antivirus, malicious PowerShell detection, and correlating threat actor behavior. While many people think that a data scientists job is finished when a model is built, the truth is that cyber threats constantly change and so must our models. The initial training is only the start of the process and ML model maintenance creates a large amount of technical debt. Google provides a helpful introduction to this topic in their paper Machine Learning: The High-Interest Credit Card of Technical Debt. A key concept from the paper is the principle of CACE: change anything, change everything. Because ML models deliberately find nonlinear dependencies between input data, small changes in our data can create cascading effects on model accuracy and downstream systems that consume those model predictions. This creates an inherent conflict in cyber security modeling: (1) we need to update models over time to adjust to current threats and (2) changing models can lead to unpredictable outcomes that we need to mitigate. Whenever we retrain our cyber security-focused ML models, we need to able to calculate and control for churn. Formally, prediction churnis defined as the expected percent difference between two different model predictions (note that prediction churn is not the same as customer churn, the loss of customers over time, which is the more common usage of the term in business analytics). It was originally defined by Cormier et al. for a variety of applications. For cyber security applications, we are often concerned with just those differences where the newer model performs worse than the older model. Lets define bad churn when retraining a classifier as the percentage of misclassified samples in the test set which the original model correctly classified. Churn is often a surprising and non-intuitive concept. After all, if the accuracy of our new model is better than the accuracy of our old model, whats the problem? Consider the simple linear classification problem of malicious red squares and benign blue circles in Figure 1. The original model, A, makes three misclassifications while the newer model, B, makes only two errors. B is the more accurate model. Note, however, that B introduces a new mistake in the lower right corner, misclassifying a red square as benign. That square was correctly classified by model A and represents an instance of bad churn. Clearly, its possible to reduce the overall error rate while introducing a small number of new errors which did not exist in the older model. After retraining, the distribution of P(URL=malicious) changes and all .com domains receive a higher score. The alert rules may need to be readjusted to maintain the required overall accuracy of the combined system. Ultimately, finding ways of reducing churn minimizes this kind of technical debt. Figure 2 shows our data split and how it compares to the original EMBER data split. We have built a LightGBM classifier on the training data, which well refer to as the baseline model. To simulate production testing, we run the baseline model on test 1 and record the FPs and FNs. Then, we retrain our model using both the training data and the FPs/FNs from test 1. Well refer to this model as the standard retrain. This is a reasonably realistic simulation of actual production data collection and model retraining. Finally, both the baseline model and the standard retrain are evaluated on test 2. The standard retrain has a higher accuracy than the baseline on test 2, 99.33% vs 99.10% respectively. However, there are 246 misclassifications made by the retrain model that were not made by the baseline or 0.12% bad churn. Since our rationale for retraining is that cyber security threats change over time, e.g. concept drift, its a natural suggestion to use techniques like incremental learning to handle retraining. In incremental learning we take new data to learn new concepts without forgetting (all) previously learned concepts. That also suggests that an incrementally trained model may not have as much churn, as the concepts learned in the baseline model still exist in the new model. Not all ML models support incremental learning, but linear and logistic regression, neural networks, and some decision trees do. Other ML models can be modified to implement incremental learning. For our experiment, we incrementally trained the baseline LightGBM model by augmenting the training data with FPs and FNs from test 1 and then trained an additional 100 trees on top of the baseline model (for a total of 1,100 trees). Unlike the baseline model we use regularization (L2 parameter of 1.0); using no regularization resulted in overfitting to the new points. The incremental model has a bad churn of 0.05% (113 samples total) and 99.34% accuracy on test 2. Another interesting metric is the models performance on the new training data; how many of the baseline FPs and FNs from test 1 does the new model fix? The incrementally trained model correctly classifies 84% of the previous incorrect classifications. In a very broad sense, incrementally training on a previous models mistake provides a patch for the bugs of the old model. Incremental approaches only work if the features of the original and new model are identical. If new features are added, say to improve model accuracy, then alternative methods are required. If what we desire is both accuracy and low churn, then the most straightforward solution is to include both of these requirements when training. Thats the approach taken by Cormier et al., where samples received different weights during training in such a way as to minimize churn. We have made a few deviations in our approach: (1) we are interested in reducing bad churn (churn involving new misclassifications) as opposed to all churn and (2) we would like to avoid the extreme memory requirements of the original method. In a similar manner to Cormier et al., we want to reduce the weight, e.g. importance, of previously misclassified samples during training of a new model. Practically, the model sees making the same mistakes as the previous model as cheaper than making a new mistake. Our weighing scheme gives all samples correctly classified by the original model a weight of one and all other samples have a weight of: w=+|0.5Pold(i)|, where Pold(i) is the output of the old model on sample iand ,are adjustable hyperparameters. We train this reduced churn operator model (RCOP) using an of 0.9, a of 0.6 and the same training data as the incremental model. RCOP produces 0.09% bad churn, 99.38% accuracy on test 2. 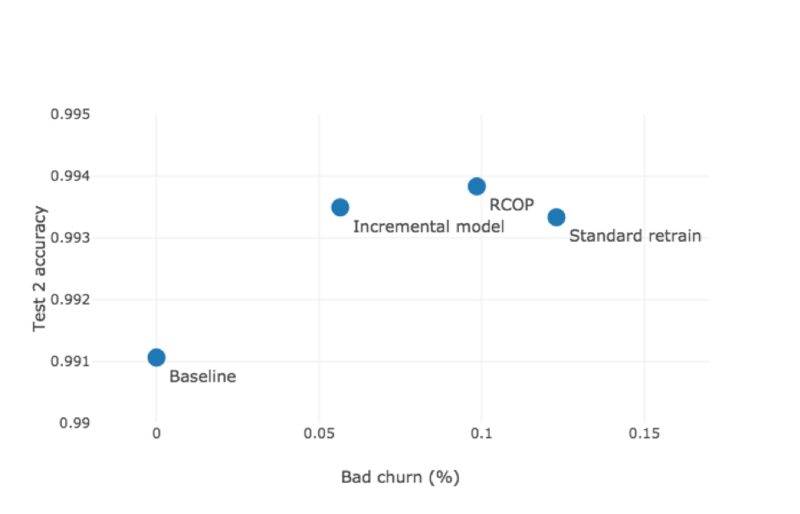 Unexpectedly, both the incremental model and RCOP produce more accurate models with less churn than the standard retrain. We would have assumed that given their additional constraints both models would have less accuracy with less churn. The most direct comparison is RCOP versus the standard retrain. Both models use identical data sets and model parameters, varying only by the weights associated with each sample. RCOP reduces the weight of incorrectly classified samples by the baseline model. That reduction is responsible for the improvement in accuracy. A possible explanation of this behavior is mislabeled training data.Multiple authorshave suggested identifying and removing points with label noise, often using the misclassifications of a previously trained model to identify those noisy points. Our scheme, which reduces the weight of those points instead of removing them, is not dissimilar to those other noise reduction approaches which could explain the accuracy improvement.